Some folks assume that ALL pergolas are pretty much the same when it comes to design and style. Well, not exactly. That may have been true a while ago, but not anymore. 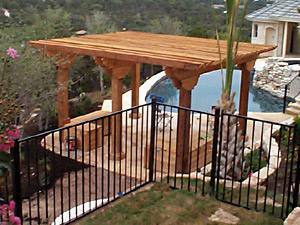 Yes, a pergola is a slatted outdoor structure adding shade and definition to a deck, walkway, garden, pool or patio area. 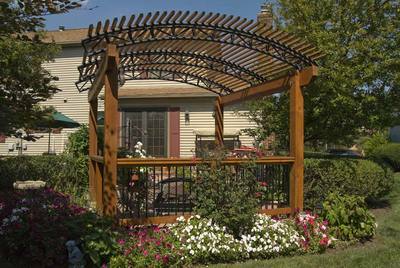 And yes, pergolas are a perfect framework to support vines and hanging baskets of plants or flowers. However with a custom pergola by a reputable contractor the sky’s the limit when it comes to unique designs for both function and flair. 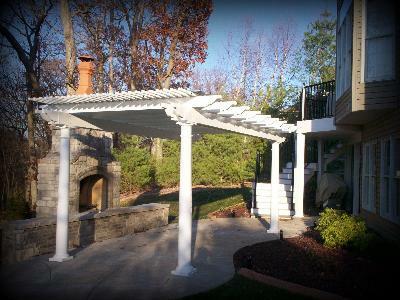 Here in St. Louis we’ve designed and built our fair share of pergolas for customers throughout the region. But we’d also like to share a few other ideas from Archadeck to get those design-juices flowing. So first, let’s break down the sub-categories: material options, size and style, types of accessories. Keep in mind that pergolas are out in the open and subjected to sometimes harsh elements 24/7/365. Consequently, building materials definitely need to withstand all types of weather. Not to worry. There are plenty of product choices in natural woods including softwood and hardwood as well as man-made materials. 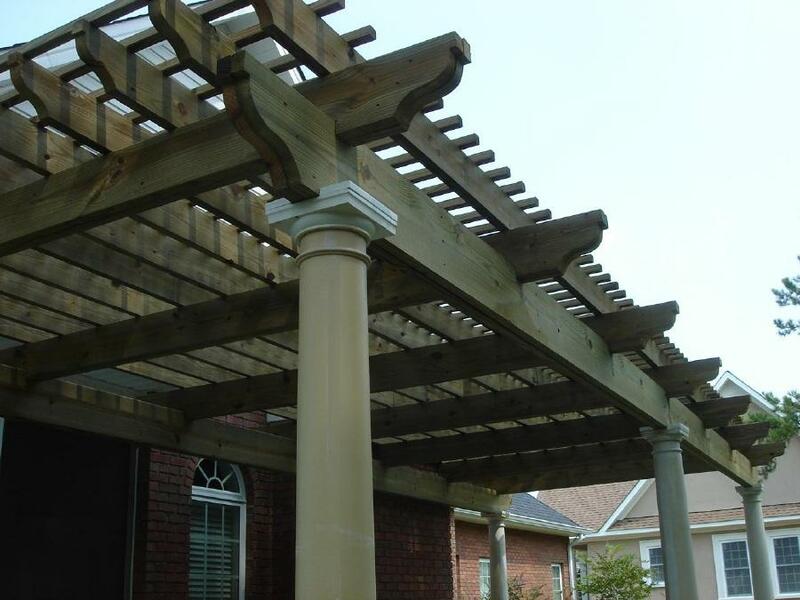 Generally speaking, softwoods and vinyl are the most common building materials for the majority of our pergola projects. Nonetheless, we’ve seen some gorgeous construction with Ipe, fiberglass and metal too. Much of it depends on your personal preference and sense of style. But depending on where you live, one particular material may be favored over another. For instance, powder coated aluminum pergolas will hold up against salt-water air and tend to be popular for people living along a coastline. If you live in a wooded area, a timber pergola may make the most sense. The ideal size and style of a pergola is best determined by the genre of your existing architecture, the characteristics of your backyard and what function it will serve. For example, a pergola is most fitting as an extension of a house when attached to a deck or patio, especially if the lot is smaller. 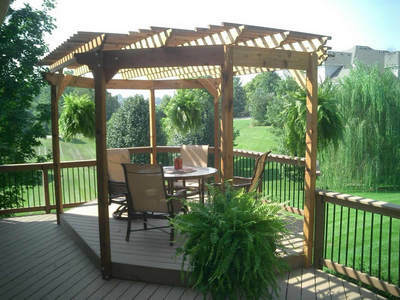 On the other hand, a standalone pergola can blend well with a lush lawn or garden, particularly if a backyard is large. Frequently homeowners want a pergola over a deck or patio and then its size should be proportional to complement the outdoor space. It’s common sense really. Style, though, can open up several doors. 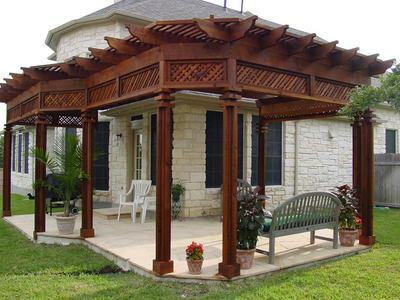 Custom pergola shapes might be rectangular, octagonal, circular, arched, fanned, or multilevel. Slat spacing may be adjusted for customization too. Then, depending on the decor of the interior and the tone of exterior spaces, you may opt for a look that’s traditional, contemporary, rustic, modern or bungalow-ish. Today’s outdoor accessories can be added to a deck, porch and pergola too. Of course outdoor rugs, comfy furniture, plants and even a hanging swing are great for starters. Weather-proof (and rain-proof) fans can be mounted to the interior slats of a pergola, creating a comfortable breeze when the weather is hot. Cloth canopies or mosquito nets are another customer-added option. Install a swing for those lazy-days of pure relaxation. 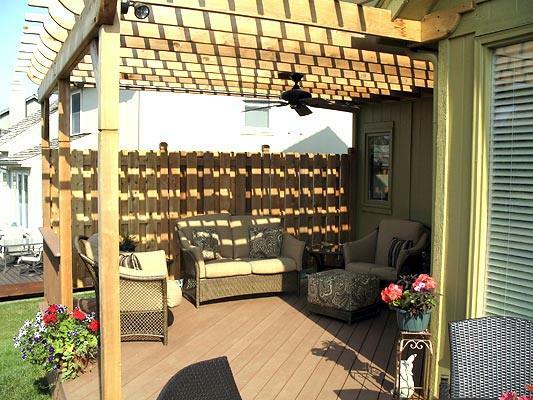 If your neighbors homes are in close proximity to yours, a privacy fence and pergola can be combined. For additional solitude, lattice can surround the posts and framework to create an outdoor room. 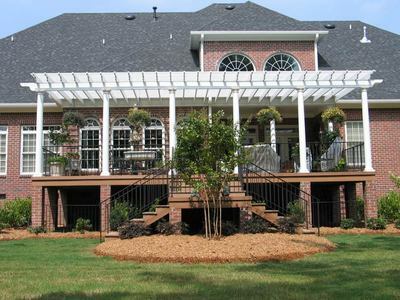 Pergolas can be completely customized to complement any home and outdoor space. They can be designed in all sorts of interesting sizes and shapes with a wide variety of materials and accessories too. 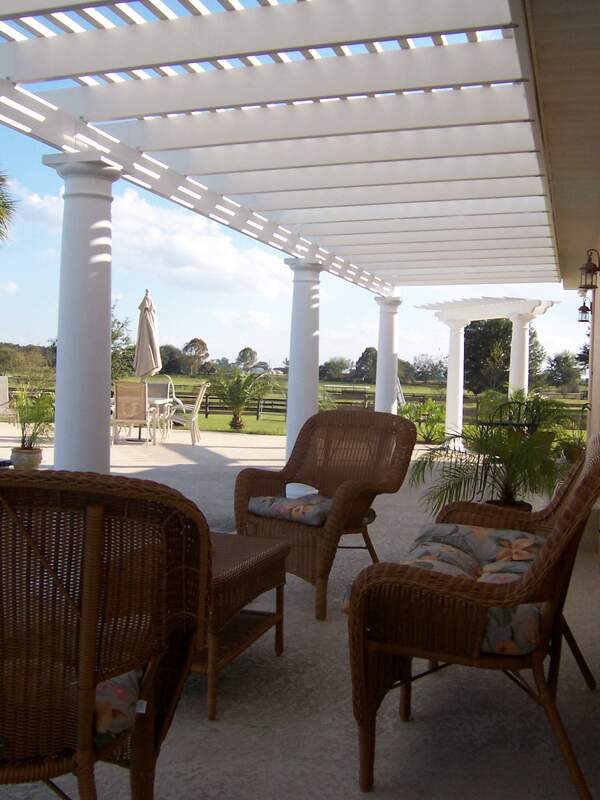 And a reputable contractor like Archadeck, is a perfect resource to help plan and construct any type of outdoor living space including shade pergolas. So if you live in the Greater St. Louis, Missouri region, please consider talking to Archadeck. We’re located in St. Louis West County and can be reached by visiting our website, west-county.archadeck.com or by giving us a call 636.227.0800. If you live outside of this area, visit archadeck.com, key in your zip code and find a location nearest you.